"Our dock is fantastic! We love it - our kids love it, our guests love it and one of these days we'll definitely want to expand it. We wanted something that was low maintenance - actually NO maintenance and that's what this is. Jim assured us that it could be left in the water over the winter and sure enough, it has endured a few winters now with no problems whatsoever. "Just a quick word to let you know how pleased we are with our floating Dew Dock. 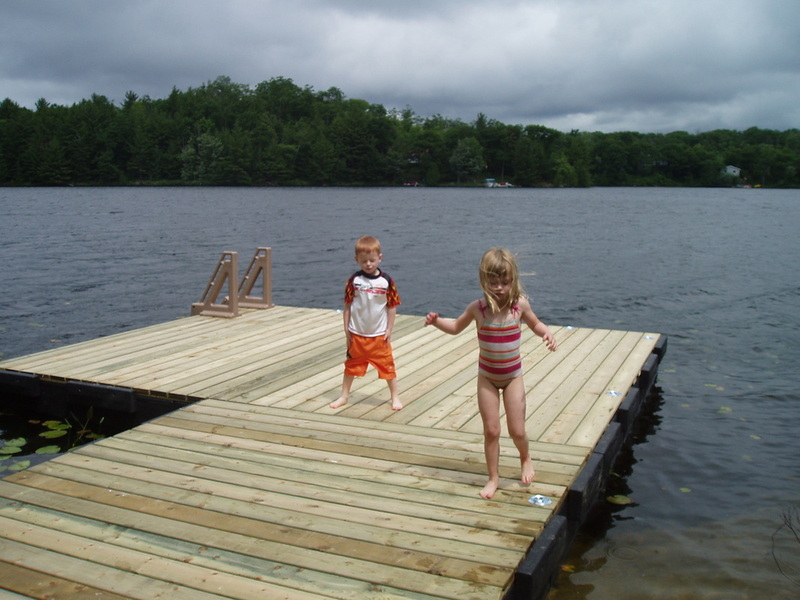 When we first installed the dock a few years ago, the assembly was straightforward and completed over a weekend. Your service and assistance in ensuring that we had all the required parts was very helpful. To this day, we are still impressed with the dock’s stability. Each fall, the water levels on Six Mile Lake drop and our old pipe dock was always getting damaged by shifting ice flows. Now, with our Dew Dock, we simply release the dock from the chains moored to the sunken concrete anchors and float the entire dock over to be parallel with our shallow shore line. When the water levels drop, the dock settles on the lake bottom, stays there throughout the winter, then rises again with the water level in the spring. We then float it back into position and re-attach the mooring chains. It’s a perfect docking system for any water front property with changing water levels. Thanks for all your help!" "I was very pleased to find out that there was a a Dock Supplies in Meaford where my cottage is. The work that was done and the dock was terrific. I will be planning to add to my dock this year due to the low levels of Georgian Bay and we will be using James Smith."